Kevin Perkins is one of those anglers who sees the funny side of everything, and there are plenty of funny goings-on in fishing. 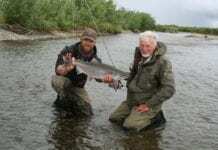 But not everybody is able to convey the funny and often quirky nature of fishing. But Kevin can. He’s the Alternative Angler who sees that side of things that most of us miss because we’re too busy going about the serious business of catching fish and often missing the satire and laughs along the way. Never mind smelling the flowers, don’t forget to take time out to see the satirical side of fishing life and grab a laugh along the way as well. So here’s a regular column from Kevin Perkins to remind us that life is for laughing at, or taking the p*** out of, whenever we can. Just to let you know about the above event, which was held at a small but intimate venue between Christmas and the New Year. It is staged to allow some of the lesser-known contributors on FM to get together and revue the year’s events, and to do a bit of forward planning for the year ahead. Courtney Fysshe-Laitley, salmon beat owner and FM game fishing correspondent, reluctantly left his substantial Home Counties manor house for a down market evening with the peasantry. His spirits sunk as soon as he heard it would not be a black tie event, in fact it turned out to be a no tie event! After a few hours of topping up his spirits (large, well-aged single malts, of course) he was involved in a very unseemly fracas towards the end of the evening. First reports were innocent enough in that he had suffered from being ‘tired and emotional’ (in the manner of John Thompson) and that he ‘came over misty eyed’ after a private session with Tess Tickle the column dancer supplied as the evening’s entertainment. She would have been a pole dancer, but when you are that bow-legged, you need something more substantial to wrap your legs around…..